If a business needs to expand quickly they may decide to adopt one or more of the following integration methods: Vertical Integration, Horizontal Integration, or Conglomerate Integration. 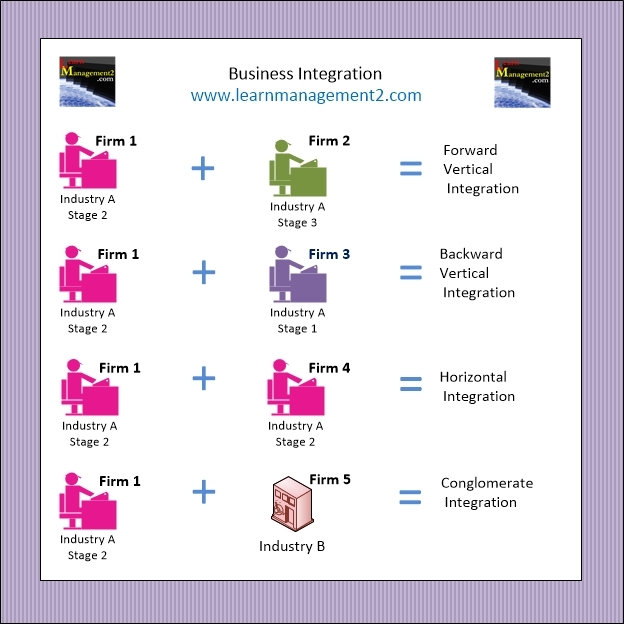 This diagram explains the different types of integration that a business could undertake including vertical integration, horizontal integration, conglomerate integration and diversification. Vertical integration takes place when a business decides to buy another business that operates in the same industry as them but is at a different stage of the production process. Forward vertical integration means either taking over or merging with a business that you trade with. Let's imagine Learn Management PLC produces management books and articles and sells these to a large bookshop chain. If Learn management PLC may decide to buy or merge with the bookshop chain this would be called forward vertical integration. Forward vertical integration guarantees future business with the company that the integration takes place with. Forward vertical integration ensures that there is a guaranteed place for the product to go i.e. the next stage of the production process. Backward vertical integration involves taking over or merging with a supplier. Using the fictional example above, if Learn Management PLC took over their fictional paper supplier “Paper r us & just 4u” this would be an example of backward vertical integration. This way Learn management ensure that they have paper supplied to them in a way that suits them. Backward vertical integration can reduce costs as a business will receive the product (which in our example is paper) at cost price and not have to pay money towards a supplier's profits. When a business buys another business that is at the same stage of production and within the same industry as them this known as horizontal integration; effectively the firm is buying out one of its competitors. The other advantage to horizontal integration is that firms can benefit from the economies of scale created by the integration. Firms may also be able to reduce costs by removing duplication e.g. only one head office, IT department and sales team instead of two. Sometimes firms like to move into areas that are not related to their core business. This could be because they wish to spread their risk over a wide portfolio. This is known as conglomerate integration or diversification. The advantage to conglomerate integration or diversification is that it provides businesses with the opportunity to expand their product range or service offering. It may also increase brand awareness if the business decide to call the business they have bought the same as their own. Some businesses decide to buy a business that is not related to their existing products or services because they think they can increase their profits i.e. purely for financial reasons. The disadvantage to conglomerate integration is that the company is not experienced in producing or offering the items produced by the business they are buying. This can be risky especially if they are hoping to expand the business they have bought.